Daintree Valley Haven: Wot Wet? We're really happy for all the folks in the drought-devastated areas of central Australia who have been enjoying the best rains in decades - although some places have had too much and are now suffering serious floods. Feast or famine ... drought or flood ... the story of our beautiful Australia! Whereas here in the far north we are enjoying magical weather, although it is still unusually hot for March which is officially our autumn. At the start of the week Peter and I really made the most of the fine weather and got stuck into 'vegetation-attack' - and just about exhausted ourselves trying to do too much in the heat. So Thursday we bailed out and treated ourselves to a couple of relaxing days in Cairns and came back this morning raring to go again. This was the view from our hotel room - not bad eh???? When we got home we were relieved to find that the birds have still left us a good crop of Rambutans! And the Mangosteens shouldn't be too long now, although they have yet to turn deep purple. Sooo jealous that you have rambutans and mangosteens. They were my favourites when we lived in Malaysia.Barb. 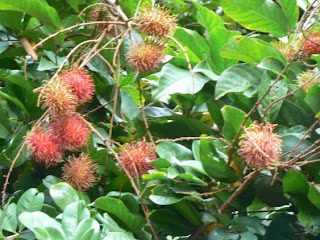 Hi Barb - just to rub it in breakfast this morning was FRESH-PICKED RAMBUTANS with muesli!